A research paper from the Guenza lab has been featured on the cover of the September 21st edition of Soft Matter. The journal, a publication of the UK’s Royal Society of Chemistry, deals with the fundamental science underlying the behavior of soft matter, with a focus on the interface between physics, materials science, biology, chemical engineering and chemistry. The paper, titled “Coarse-graining simulation approaches for polymer melts: the effect of potential range on computational efficiency”, was authored by postdoctoral scholar Mohammadhasan Dinpajooh and Professor Marina Guenza. Beginning in 2015, the University of Oregon launched the Sustainability Award Program to recognize individuals whose contributions deepen our culture of sustainability across a range of institutional activities. The 2018 Sustainability Award recipients were announced at an awards ceremony on May 30th, 2018. 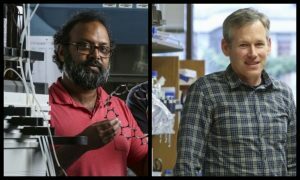 Two Chemistry and Biochemistry faculty members were among the award recipients. Jim Hutchison received the Research Innovation Award, which is sponsored by the Associate Vice President for Innovation. 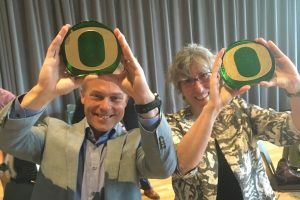 This award recognizes University of Oregon projects whose innovations were developed in the course of UO research and are now offered as commercially available products or services that improve sustainability. DeFUNKify laundry products, which were developed as a result of research discoveries made in the Hutchison Lab, exemplify this type of innovation. 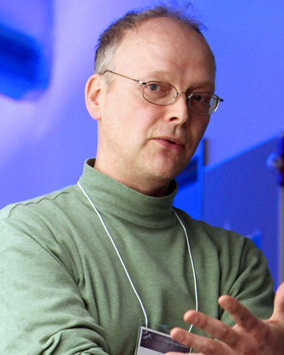 Professor Hutchison also founded the first center for green nanoscience, the Safer Nanomaterials and Nanomanufacturing Initiative (SNNI). The goals of SNNI are to develop new nanomaterials and nanomanufacturing approaches that offer a high level of performance, yet pose minimal harm to human health or the environment. 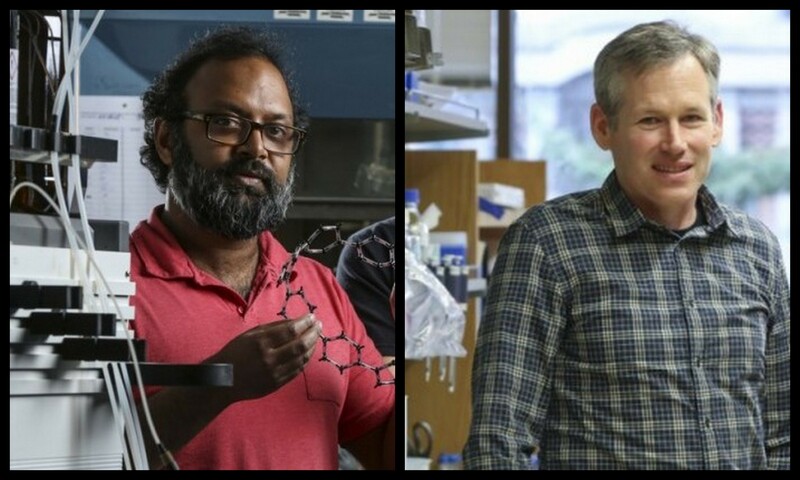 Chemistry and Biochemistry’s Ramesh Jasti and Ken Prehoda are among fifteen faculty members selected for the prestigious University of Oregon Fund for Faculty Excellence Awards. The Fund for Faculty Excellence Awards was established in 2006 through the support of Lorry Lokey and is designed to recognize, reward and retain nationally competitive faculty members who have a record of excellence in research, scholarship, creative accomplishment and education. The awards provide faculty members with a $20,000 salary supplement or $30,000 for research support.